Try the delightful Source Coffee Shop and Abantu Fair Trade shop in Bourn. Heading into Bourn from the old St Neots Road, look out for the signs on your left, almost opposite the Doctors' Surgery. The address is Units 5/6 Manor Farm, Alms Hill, Bourn CB23 2SH. Opening hours are: Mon to Fri 9.30am to 4.00pm, Saturday 11.00am - 3.00pm. 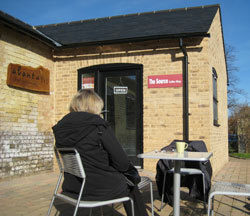 Tel 01954 713996. www.abantufairtrade.co.uk/ Excellent coffee and food, friendly helpful staff. Shop next door for a wide range of Fairtrade products. Free car parking next to an ancient barn.